We received the following information from Rachel Warren, Research Coordinator at McMaster University, regarding a new study about access to scientific information, healthy aging and cancer prevention. I am a Research Coordinator working with the McMaster Optimal Aging Portal (the Portal), a free website dedicated to increasing public accessibility to the best available scientific evidence about healthy aging and common health conditions. 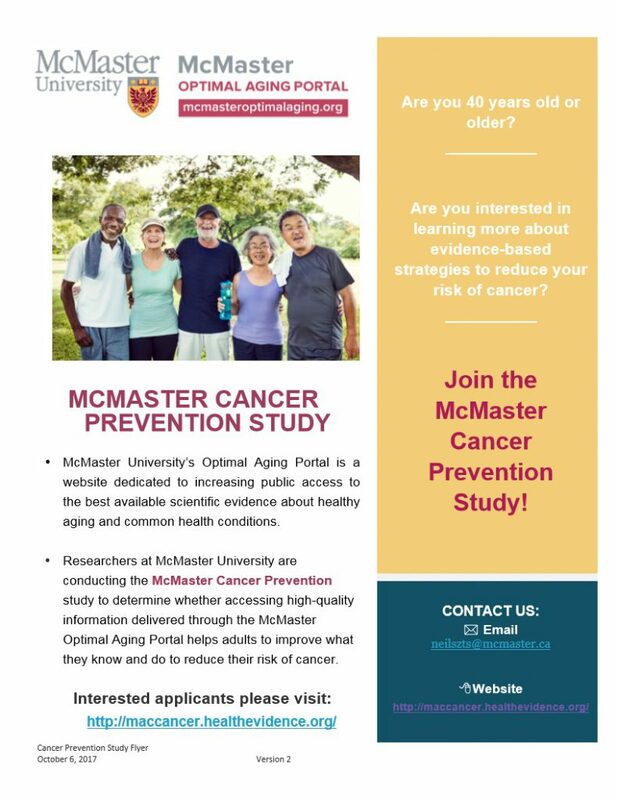 We are in the process of reaching out to organizations across Canada to help us recruit middle-aged and older adults who may be interested in participating in a study (funded by the Canadian Institutes for Health Research) to understand the impact of the McMaster Optimal Aging Portal on knowledge and behaviours related to cancer prevention. Specifically, we are interested in recruiting adults from traditionally underserved populations (e.g., rural/remote areas, lower socio-economic backgrounds, lack of and/or irregular access to a healthcare provider etc.). We are very excited to inform you that the study has launched and we are still actively recruiting participants! It would be much appreciated if you could share this opportunity within your networks. Please let me know if we can work together to connect this study to interested citizens. Please contact the study coordinators if you are interested in participating. Durand Park Skating in 2018!